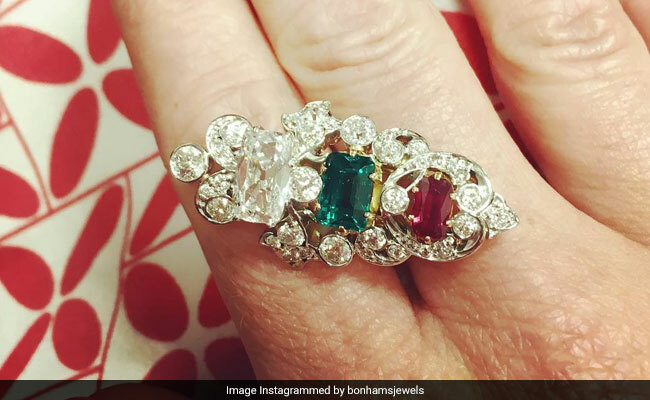 New York: A 20th-century brooch bought at a garage sale for just eight dollars has fetched over USD 26,000 at an auction here, after it was found to be studded with diamonds, an emerald and a ruby. Set throughout with old European-cut diamonds, the brooch features an old mine-cut diamond, weighing 1.39 carats, a rectangular-shaped emerald originating from Colombia and weighing about 1.50 carats and an oval-shaped Burmese ruby, weighing 0.60 carat. "The owner of the brooch gave it to her daughter to wear to church but she placed it in the bottom of her handbag and forgot about it. "On a visit to a jeweller many months later, she was told the brooch was not costume but was, in fact, a very real and very valuable piece of 20th-century jewellery," said Bonhams Auction house in the US. The Gemological Institute of America has tested the brooch and confirmed it is gem quality, the auction house said. The brooch was auctioned for USD 26,250 on September 19, Bonhams said. "This is a really wonderful story and it just goes to show, treasures are really everywhere," Susan Abeles, head of jewellery at Bonhams was quoted as saying by 'New York Post'. "What makes this brooch particularly impressive is that it features gem quality stones. These kind of discoveries do not happen a lot so we are always excited to see how much the piece will achieve at auction," Abeles said.